Early in his ministry, Jesus returns to Nazareth– his home town. There he announced his radical ministry in a synagogue. Are we ready to join him? This Sunday, we will continue to look at the life that Jesus modeled for us. As we see how he lived, we see how we can live as well. After Jesus is tempted by Satan in the desert, he begins teaching and preaching throughout Galilee. In time he returns to his home town– Nazareth. In a very dramatic way, Jesus announces the focus of his ministry– he announces what he is going to do. And it is incredibly radical. It is also important for us to understand today– especially with everything that is going on around us. 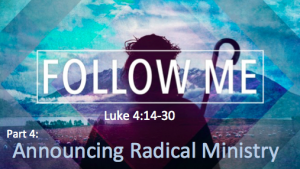 To prepare, read Luke 4:14-30. As you read, notice how the people react. The Bible study is currently on a break.